Perhaps the only bill I’ve ever seen that has a picture of the person from whom the money was stolen. Maybe this is special Twilight-Zone money, and the face of your victim appears on every bill until you go mad and get killed by another thief and end up on a bill that ends up in a church collection plate, just to complete that sense of Irony around which the universe, according to Serling, is apparently based. I lie! It’s Zemaite, as she was known, a famous national poet. Her psuedonym meant "a woman from the region of Samogitia." 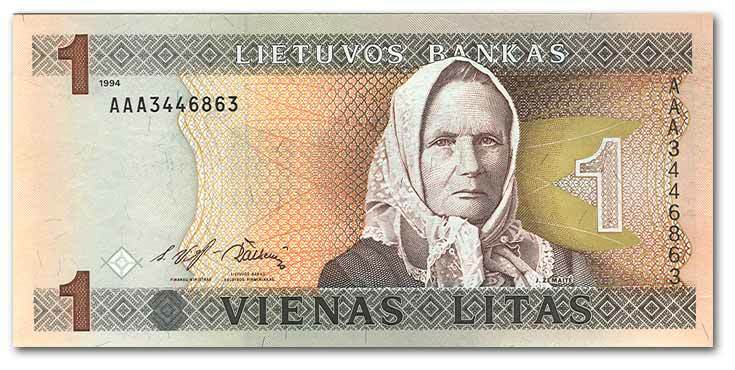 There: you've just learned more Lithuanian history in one paragraph than you learned all year long.